Born in 1925, Bill was in business in Philadelphia when his son began rowing in a New England secondary school. Bill became fascinated with rowing, gave up squash and in 1975 joined a rowing club on Boathouse Row. Philadelphia was the capital of rowing in the USA at that time. He must have rowed with rowing legend Joe Burke, as he rowed here in classic Joe Burke style. He also must have been a quick study because in 1985 he went to Europe to his first of many FISA (the governing body of world rowing) World Masters Championships. He won a total of 39 Gold medals up though 1994. The last 4 were after a total hip replacement! He and Josie, his wife, moved to Hilton Head in 1986 and started the Palmetto Rowing Club the next year. In 1989 he, along with Walt Graver, helped develop what at that time was South Carolina’s only high school rowing program. The Hilton Head High School crew became a varsity sport in 1997. 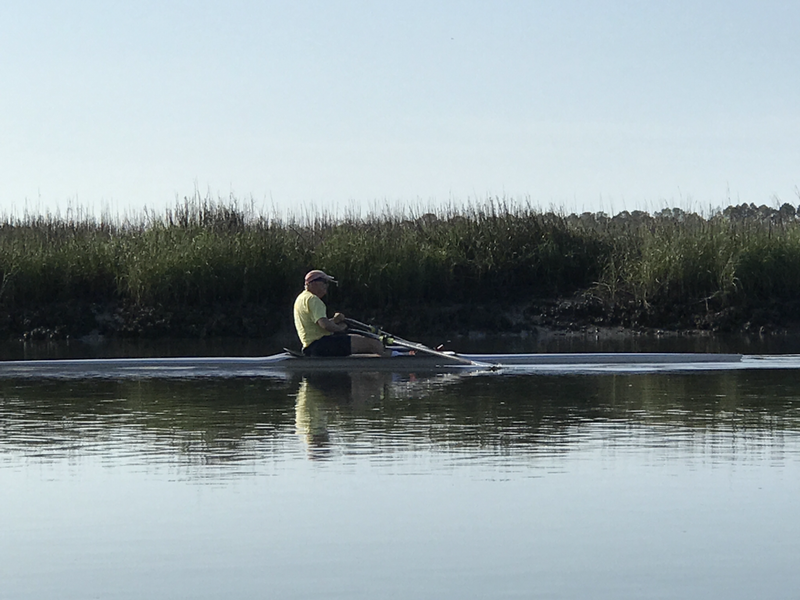 In addition he developed and promoted a fall regatta, The Head of The Broad, which was a staggered 3 mile race from Broad Creek Marina to the Old Oyster Factory. While successful, it couldn’t attain an annual status because one fixed date each year would not allow for tidal variation. He also put Hilton Head on the map as a low budget location for Spring break practice for the ice bound Eastern collegiate crews. He was a great coach to the kids and almost the singular driving force behind the growth of the PRC as well as a force in the Town of Hilton Head Island and his Church where he sang in the choir. He died 4 December, 2004 after a long hard fight with cancer.